Published by Picador USA/St. Martin’s Press. Hardcover and Tradepaper. Buy Hawk Flies Above. Click here. Rarely is the story of childhood and its loss told as gracefully as it is in this book. 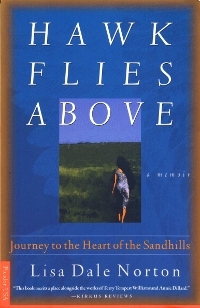 Set in the rolling prairie dunes of Nebraska, Hawk Flies Above captures an idyllic time and place, seen through the dreaming eyes of a child and the experienced eyes of a wounded woman who returns home to heal herself. Lisa Norton grew up in the late 1950s and 60s, spending summers with her father, mother, brother, grandparents, and friends at Lake Ericson, a reservoir of rich life set deep in the Sandhills. Describing her family’s history, and the magical environment of the lake—mown paths through tall grass, a swinging bridge, a secret garden, herons and fish and dragonflies and plants—Norton evokes a version of paradise. But undercurrents gradually drove her parents apart, and when her mother left in a car “colored like a prairie storm,” Lisa Norton began a troubled journey that took her far from home. After years of to-and-fro travel, a stranger pulled her off a street, attempted to kill her, but raped her instead. In the aftermath of this event, Norton made her way back to Lake Ericson, the safe place of childhood and family. Bearing witness to a fragile land now changed and threatened by time, she finds a voice in the diminishing prairie and begins to recover herself by naming what might soon vanish forever. Part memoir, part natural history, Hawk Flies Above is written with a poet’s loving precision and the passion of a woman who refuses to forget.